Aptie Sookoo, public-health inspector with the local health unit, explaining that the adult female blacklegged tick can lay up to 2,000 eggs at once. Sookoo told members of the board of heathWednesday that ticks are becoming an increasing concern in Prince Edward County. Photo by Matthew Murray, QNet News. BELLEVILLE – Public-health inspector Aptie Sookoo had members of the local board of health in shivers on Wednesday morning. 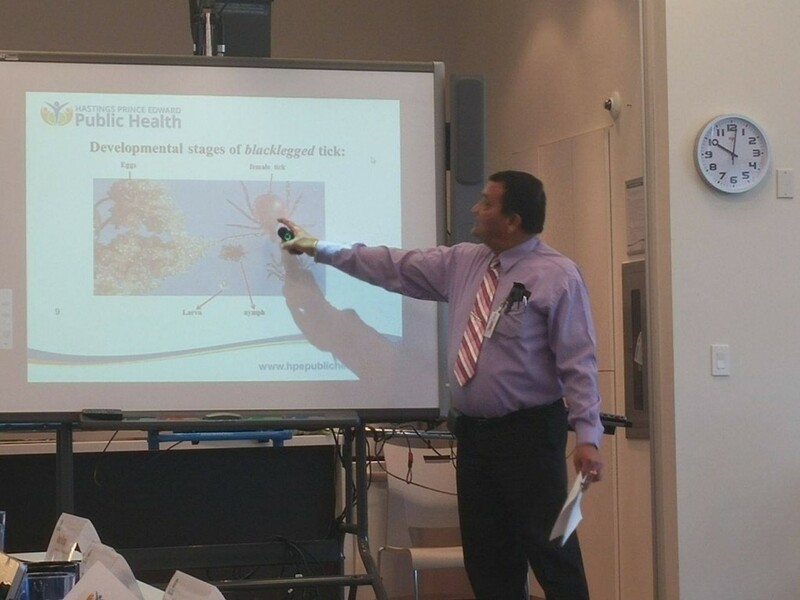 Sookoo presented a report revealing that Prince Edward County is now considered a high-risk area for ticks, which can infect humans with Lyme disease. So many blacklegged ticks from the county have tested positive for Borrelia burgdorferi, a parasite that causes Lyme disease, that the health unit is no longer accepting ticks removed from bites for testing, he said. That plateau is reached when more than 20 per cent of ticks tested are positive for Borrelia burgdorferi, he said. It means that Prince Edward County is a high-risk area – a designation determined by factors such as geographical location, the number of ticks tested and the percentage of infected ticks. While 11 per cent of ticks tested positive as recently as 2013, Sookoo said, the level is now over 30 per cent. That is dangerous because Borrelia burgdorferi-infected ticks can infect humans with Lyme disease, which can result in the rash known as erythema migrans, neurological problems, heart issues, liver inflammation and even death. “This presentation is giving us the heebie-jeebies,” Maureen Piercy, the president of Loyalist College and a member of the board, said. Board chair Terry McGuigan agreed. “I’m going to pay closer attention when I walk through the forest now, that’s for sure,” he said. The health unit says that to protect yourself from tick bites when outdoors, you should wear light-coloured clothing and tuck it in, use insect repellent containing DEET and check regularly for ticks. If a tick has attached itself to your skin for more than 36 hours, you should seek medical attention.